More socks, less holiday | carpe diem! But I’d prefer things the other way around. Ah, well. What it is to be an adult. Nonetheless, look: socks! These are winter house socks for him, although my foot thinks that’s unfair. The yarn is interesting: it’s a pure Wensleydale Longwool aran weight from Cross Lanes Farm, bought at Woolfest because the yarn has a lovely sheen, is a perfect denim blue heathered with black, and I’ve been wondering whether Wensleydale would make a good sock yarn. I must have been a magpie in a previous life: I like shiny, worsted yarns that catch the light to show how the stitches flow in the fabric. And this is lovely stuff, shiny but soft, and developing a lovely slight bloom of loose fibre as I knit it. On 3mm needles (magic loop) it’s making a dense, soft fabric that I think I’ve finally got sized to his liking for his feet. I just hope it doesn’t felt badly during wear. I’m beginning to feel the urge to knit a garment. Real clothing. Socks somehow seem a bit like ‘cheating’ now that I now I can knit them to fit me, and possibly him. I think I’ll want something more challenging soon. 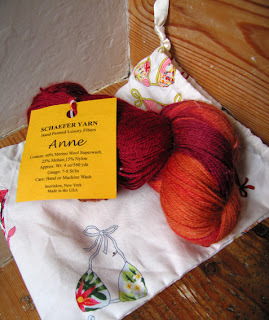 So why on earth have I just ordered more sock yarn? 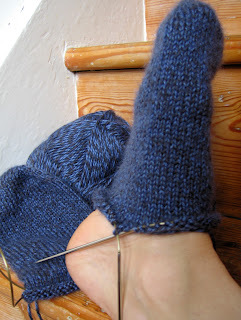 Because on Sunday night I dreamed of knitting socks. I frequently dream of knitting. How sad is that? I’m actually not certain it is sad; it may be that my knitting skills will improve because of it. Let’s keep thinking that, shall we? Mindie, I bought two of the three patterns the Museum had for sale; the Gairloch diamond stitch pattern (charted) and another for a man’s sock with Scotch thistles decorating the wide knit panels in the ribbing. A similar pattern with the Mackenzie stag instead of the thistle had sold out (not that I wanted it). Anyway, I dreamt I was knitting the Gairloch pattern. But not in sane, traditional colours. Apparently my subconscious wants ‘Indisch Rot’ and ‘Gewitterhimmel’ from Claudia, the Wollmeise. Next week I’ll see if it’s possible to do this without going blind. If I need a break, I could use the prize I won for donating to Claudia’s MS Ride. Thanks, Rebecca! I must say an even louder, more heartfelt ‘thank you’ to all of you for reading my words. It’s such an ego boost to read your comments, especially when I’m feeling down. Incidentally, I don’t know the best way to respond to questions in the comments; it’s more personal if I answer directly in another comment, but I don’t know whether you’re obsessive enough to check for an answer, especially when as now I’m so slow. Catsmum [Everyone stop reading this and go see the quilt! ], I can only approximate the Gaelic pronounciation. I’ve got a ‘Teach Yourself Gaelic’ course sitting on my desk, but it takes more concentration than I’d thought; [did you see that lightbulb?] I might be able to manage it while knitting, though. ‘Baosbheinn’ I can do, sort of, because I checked with a native Gaelic speaker. It’s my favourite of the Torridon mountains; I loved that long ridge even before I discovered the name means something like ‘magic mountain/wizard’s peak’ or, alternatively ‘hill of the forehead’. The latter because seen from the coast the western end looks a bit like a craggy, noble face. ‘Baos’, the first syllable, should sound like ‘bush’ but modify that ‘u’ with a hint of ‘e’ as it would sound in ‘besh’. ‘Bheinn’ is roughly ‘ven’, with a short ‘e’. I spent an entire evening muttering that name to myself so I can get it right. After all, names have power. * Believe it or not, I actually threw the last half packet of Bourbon Cream biscuits (my favourites!) in the bin last night to prevent them following the first half down my throat. I can has cookie? NO. This entry was posted in Uncategorized on July 19, 2007 by sarahw. First off, thanks for the suggestion about blocking. You had me running for the iron as it seemed the easiest way to give it a test and see. It looks better, much better and has re-enthused me for the rest of the project. Secondly, please don’t think you are mad to dream about knitting because if you are it means I am too!Love the socks, they look ideal for the winter. Have you enough to knit a matching pair for you? No… but I could buy more, I’m sure I could. I also have 250g? of Wensleydale top in my fibre stash so I could spin it for socks for me and then knit it into socks if I did a good job. I’m spinning my first superwash merino 2-ply for socks now, and I don’t know whether I’ve got that right yet. I need to sort out how to three-ply. All my favourite sock yarns are 3ply. The wensleydale looks interesting & Cross Lanes Farm is only about 3/4hr from here. Maybe a call on a trip out later on this ‘summer’!I’m impressed by the firm hand delt to the biscuits. Its the only way to do it! I’d be fishing the biscuits out of the bin. Scary, huh?The wensleydale will probably have a bloom of fluff, a halo of sorts, when you’re done. This is lovely and warm and picks up tons of dirt every time the socks are worn. I know this because I have made both mohair blend and lincoln socks, which have similar characteristics. They’ll be great, ignoring the dust attraction qualities– I still have mine and wear them every winter.Blog comments are a favorite part of my day–so I hope they are cheery for others, too, just as you say! It’s a bit of conversation in an otherwise quiet workday…a virtual hug. Are you doing OK with all the rain? Give us a post and let us know you’re ok!